Expect some welts to emerge at CNN's GOP debate Wednesday night as the 11 top candidates fight to stand out. There may likely be jabs about hairdos and leadership styles. But at this stage of the campaign, candidates want to sound substantive, especially on the issue Americans care about most: the economy. Most Republicans agree on this: the Obama economy has problems. The solution, they say, is for America to grow faster. Jeb Bush and Chris Christie have shared their plans on how they would nearly double U.S. economic growth to 4% from the current level of just over 2%. So where's the disagreement? Actually, there's plenty. Donald Trump and Ben Carson have been challenging a lot of mainstream Republican ideals -- and doing well in the polls. 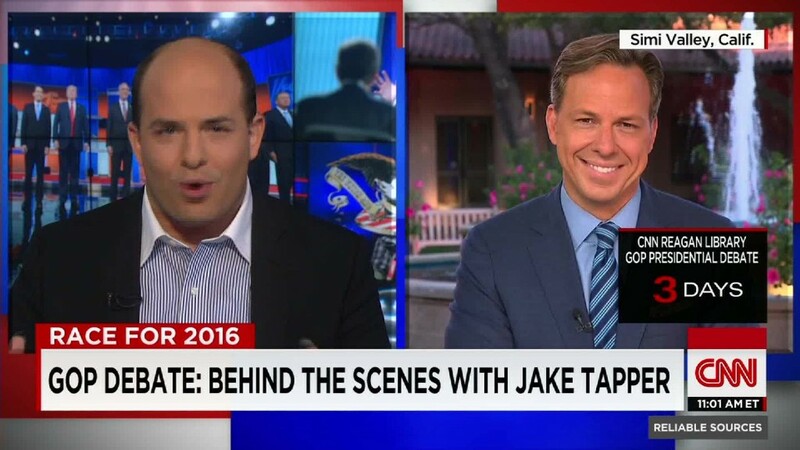 CNN debate host Jake Tapper wants to get the candidates to spar with each other, and that's likely to mean a lot of hits aimed at Trump and Carson. 1) Free trade: good or not? Trump is ready to slap taxes on goods imported from places like Mexico and China. He says America has lost too many jobs to cheaper workers abroad and he often cites the U.S. auto industry as an example. There's just one problem: there's been a major turnaround in America's auto sector lately. Trump's proposal could hurt that. His plan would also undermine years of free trade policies that Republicans have long supported in an effort to help U.S. businesses grow abroad. Candidates like Marco Rubio are likely to hit Trump over China. Rubio has put out an entire plan on how America should deal with the world's second-largest economy and its recent moves to make its currency cheaper versus the U.S. dollar. Rubio says tariffs would backfire. A better approach, he says, is getting the Trans-Pacific Partnership free trade agreement done and beefing up security in the region. Related: So what exactly is Trump's economic plan? 2) Lower taxes...on whom? Carson, who is rising in the polls, believes America should move to a flat tax system where everyone from billionaires to minimum wage workers has the same tax rate. He has suggested that rate should be between 10% to 15%. But tax experts say that wouldn't bring in enough revenue to fund the government, let alone pay off debt, as Carson says he wants to do. Republicans also disagree on how much to tax businesses. Trump and Bush want to do away with the typical Wall Street hedge fund managers' tax break known as "carried interest" that allows them to get a lower tax rate because their earnings show up as investment gains/losses instead of income. Will others follow? 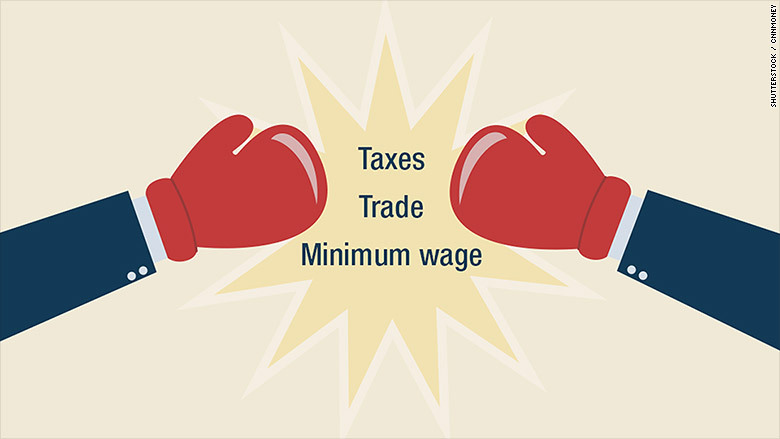 3) Minimum wage to solve inequality? Carson is the outlier here too. He's the only one of the top Republican candidates who has said he is willing to raise the federal minimum wage from $7.25. He might look for an opportunity to use this and set himself apart. Trump has said having a low minimum wage is "not a bad thing" for the country. The bigger issue is inequality. Americans are concerned, and they'll be looking for a candidate who has something authentic and credible to say in Round No. 2. In the first GOP debate, Ohio Gov. John Kasich got a bump in the polls after he said that America's economic growth needs to be felt by everyone, including "people who feel they don't have the chance to move up." 4) Immigration: more or less? It's Trump's signature issue. He wants to heavily restrict immigration, especially from Latin America, and even deport millions who are in the country illegally. His plans have been called "clueless" and costly. Other candidates are likely to bring this up again Wednesday, especially Rubio and Bush, who have very different immigration plans. From an economic perspective, Silicon Valley wants more highly skilled immigrants to keep the U.S. the top hub for innovation. On the other side of the spectrum, many big businesses depend on low-skilled immigrant labor to do jobs most native-born Americans don't want to do such as picking crops or cleaning buildings. 5) CEO & Wall Street pay. Over the weekend, Trump took on sky-high CEO pay, calling it "disgraceful." He has already criticized rival Carly Fiorina's record as CEO of Hewlett-Packard (HPQ). Trump didn't spell out details of how to change pay, but he says what's not working is the current system of corporate boards being a check on CEO compensation, since most board members are buddies of the top boss. Republicans have typically been seen as more friendly to big business and Wall Street, but Trump doesn't need outside money right now. He will likely stress that again Wednesday and challenge other candidates over their ties to Wall Street.